Blogspot is giving me one heck of time posting photos or maybe it's my ISP? So this post is abbreviated, there were going to be 6 scans, I'll try and update it later today. From 1963 or somewhere near there, here's a neat S & H Green Stamps book. We had Blue Chips stamps where I grew up in the 1970's, but these seem like the same thing. I have a bunch of Blue Chip books with the stamps in them, the pages get stiff and kinda yucky when they are pasted full of stamps! This book related to Disneyland in that you could redeem them for Disneyland tickets! 1 3/4 book for an Adult "Deluxe 15-ride ticket book". Oh boy would I like to see one of those certificates S & H would give you to take to Disneyland. Some of the places where you would get green stamps. I recall the gas stations had a machine with big circular dials, the attendant would "dial" the amount of gas you bought and the machine would dispense the blue chip stamps. It's Knott's Monday! Following up on a previous post where we compared Knott’s Berry Farms “Chicken Dinner” restaurant menu’s, today’s lets compare prices at Knott’s Steak House. You can see the previous Chicken Dinner menu post here (link). Ignore the part about how today’s post was suppose to happen in a week, since that was back in early July! Hey, it was a busy summer! I don’t know the actual date the “Steak House” opened at Knott’s. Maybe some Knott’s fan out there could let us know. I do believe the “Ghost Town Grill” was sort of the Steak House version 1, or at least its beef items did end up on the first “Steak House” Menu. Since it’s always best to start at the beginning (or at least the beginning of what’s in my collection) here is the cover and price page from the “Ghost Town Grill”. 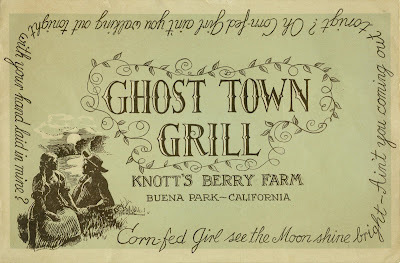 If you would like to see then entire menu/brochure, you can download it here Ghost Town Grill - Full download (9.5mb). Filet Mignon $2.50 and ice cream was a dime!!! The next five sets of menu price pages represent approximately 1955 to 1970, however a couple don’t have dates. These are brochure type menu’s with about 8 pages, mostly pictures and descriptions of the farm. The center pages have the prices as you will see below. There are 3 difference versions of the covers, one with no phone number, one with a “LAwrence” phone number, and one with the area code (714). Up first is the oldest “Steak House” menu in my collection. It’s not dated, but I would place it around 1955, anyone know for certain? Next I would place this at 1957 judging by the “Dinners served” totals running thru 1956. It’s interesting to note those are “grand totals” as the same numbers appear in the Chicken Dinner Menu. 1958 brings a couple small price increases, but most noteworthy is the addition of “Buffalo” to the menu! Check out down at the bottom of this post and you will find a complete “Buffalo Steak” menu. Was this just an off-shoot of the “Steak House”? Now from 1965 (what a great year!) no more Buffalo meat, but we’ve got some hand written price increases and Sauté Chicken Livers for $2.50! I think I just lost my appetite, wait, a boysenberry tart topped with ice cream for a quarter! OK, I’m hungry again. Wow, Dwight "Andy" Anderson looks like he has eaten a few of those steaks over the years, is that even the same guy? The last menu has no year served totals and is just a true “menu” with just four pages including the covers. I would place it around 1970, but that’s just a guess. Here is the back of the oldest Steak House menu and the only menu/brochure to actually shows the inside of the place. That General Merchandise Store sure looks fun too, is that Sam Drucker behind the counter? Lastly, here is the Buffalo Steak Menu. It appears to be part of the Steak House. Has anyone had buffalo meat? Is it any good? Do they still sell it anywhere? Is it even legal? Check back next Monday for yet another vintage Knott's Map! Come back tomorrow for some Disneyland stuff... Oh, and come back on Bonus Sunday for a few complete scans of the menus. From Monday's post (link) here is the entire Vacationland magazine. And from Wednesday's post (link) here is the entire Disneyland Guide. Fun stuff, I hope you have some leisurely time this nice Sunday to ready these gems. Welcome to Bonus Weekend! First up as promised, here is the entire "Disneyland Summer 1959" June 14, 1959 Los Angeles Times supplement. Please take the time to read each page, this really was a golden era for Disneyland. The following two wall map scans were donated by Wishbookweb, if you love vintage department store catalogs, you've got to visit this site (link). I sure respect the time and effort it takes to scan entire catalogs. Now to the Maps. This 1976 Disneyland Wall Map is such fun, this is my Disneyland. Note the attraction buildings have labels of where scenes are located throughout. In a way very cool, yet sometimes showing what's behind the curtain isn't such a good thing. Don't bother clicking on the photo below, its a low res version, use the link below for the full high resolution version. By the way, check out Wishbooks Flickr stream, WOW - (link). Don't blame me if you spend a few hours looking at this amazing collection. 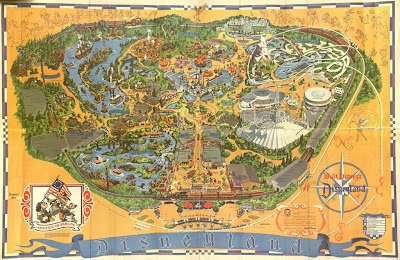 Another wonderful map, this one from 1983 and includes the "New Fantasyland". The artist seems to different, but very contemporary (for 1983), I like it. Again, don't bother clicking on the photo below, use the link below for the full high resolution version. It’s September 26, 1971 so hang on to your shriners hats, its “Foresters Nite” at Disneyland. Hey now, form a single file line, no cutting! “Sponsored by the Independent Order of Foresters” I’ve never even heard of this group, have you? The back side of a special event ticket. “The Foresters wish to inform you all sales are final”… “Should any excess monies result from this event, they will be retained by the Foresters for its service program” Nice, I didn’t realize these special events could be profitable for the Company or Organization holding it. And just because it’s so much fun and I can’t resist, here are more of this weekends special bonus of the newspaper supplement for Disneyland Summer 1959. Check out the Hills Bros. Coffee House photo. Ok, I want that fantastic coffee pot, those large and sturdy mugs, those carnation creamer cups are to die for, that menu is a must have, and even the coffee looks great! Nesbitt’s and Frito the Kid on the same page, wow, who knew they would become so rare and obscure. 5¢ for a bag of Fritos! More Fritos. This time it’s Casa de Fritos! Is that Jerry Lee Lewis on the far right??? Come back tomorrow for the entire supplement. From September 25, 1983, it’s a VIP Party at Disneyland! Since the above ticket is a little lack-luster and has very little color and since I am in a 1959 mood, here’s a peek at this weekends post. From the Los Angeles Times of June 14, 1959, this is a great advertising supplement for “Disneyland 59”. Amazing artwork like this is in about half of the supplement, the rest is full of super color photos. The back page is dedicated to the wonderful ticket books! The all new “E” ticket is making its first appearance. “Big 10” or the “Jumbo 15” ticket book, go for the Jumbo 15! Check back this weekend for the entire supplement in high resolution. This ticket is from September 24, 1975 and is "in conjunction with the 1975 Meeting of the National Association of Life Underwriters." Almost sounds like they should be wearing Shriners Hats? Free parking included, these folks knew how to go first class! The cover from the Fall/Winter 1975/76 Disneyland Guide. The “Entertainment Calendar", fun times. Come back on Bonus Sunday for the entire Fall/Winter 1975 Disneyland Guide. If you missed parts 1 and 2 of this series, be sure to view them here (part 1 link/part 2 link). Thanks again to Dave over at Daveland for getting these magenta gems to shine some color thru again. Starting off this final part of our August 1973 trip to Magic Mountain let’s take a ride on the Eagles Fight. This “Skyway” ride had two separate routes, both terminating at the top of the mountain. The “Eldorado Station” side was near EL Bumpo (present day Riddles Revenge area), it had steel towers and was around 100 feet at its peak I would guess. The “Galaxy Station” was near the Galaxy of course (present day lower level supports for Superman) it had cement towers and was WAY too tall, it seemed around 200 feet, maybe the mountain made it seem higher. This photo from a 1973 brochure shows a bucket from the Eldorado station in the foreground and the Galaxy station towers in the back ground. Absolute terror as the buckets reach the tower, my heart used to literally stop when it would cross over those wheels of death. In fact, someone did die as their bucket passed the last tower heading into the Galaxy station it plunged 50 feet down into the hillside. A newlywed couple was inside, he died, but miraculously, she survived. (link). The Eagles Flight Dual station at the top of the mountain is still there. This photo was taken in May 2008, the bottom area has restrooms that are still in use, otherwise the building is shuttered and empty. Scary…. Is that clown real? Check out the fun Troll balloons! A couple photos showing the neat animal shows they used to have. I remember these, they were informal and informative. Those poor ladies had to wear some unusual costumes. The green belt area of the Grand Prix car ride, you can see the back of one of the cars on the lower right. From an early post card series, here is the Grand Prix in all its Autopia rip-off glory. The cars were fun, if not a tad slower than the Real Autopia. Check out the Metro Monorail, BRING BACK THE METRO! Also note the massive towers for Eagles Flight and that round building is the Sand Blaster bumper cars structure, still bumping away after 37 years. Gold Rusher as seen from a souvenir postcard. I sure do like this ride, a 1971 Magic Mountain original; it gets a big smile from me every time I ride it. Here’s our balloon lady again, this time she is sitting on a fountain that was near the big Showcase Theater. I remember contemplating “acquiring” change from this fountain in the Summer of 1976 when I got dropped of with $10 for the whole day and spent it all in about an hour and a half! As with most theme park fountains this one is now a planter as seen in my May 2008 photo! Notice the bricks, did they sink or did the ground get higher? 80 Layers of slurry? In addition to the animal shows in the pics above and a petting zoo, Magic Mountain also had a Tiger! I’ve had dogs that can chew thru a chain link fence like that! From an old postcard, this is “Gambi” I wonder if he is the same Tiger as the amature slide above? There were once trains at Magic Mountain, here’s the O’l 99. This is not to be confused with the Spillikin Corners "Grand Centennial Excursion" or the “Train to Trollywood” those would come later. Looks like that “Valencia” grass could use some water. Here’s the O’l 99 in all her Post Card glory. Jed over at Vintage Disneyland Goodies informs me the O’l 99 still exists somewhere near the Mountain. I gotta check that out soon! Since this post and series are about to end, here’s a few follow-up pictures. The Jet Stream still looking great, this attraction was getting kind of neglected in the early 2000’s, nice to see it sparkle and shine. Not much sparkle or shine here. This was the Four Winds Restaurant. It was also the Laughing Dragoon and the “______ House”. It probably has had other names too. Sad to see it closed and in disrepair. This location offers fantastic views and the Mountain needs a good sit-down restaurant. Hopefully the new management team at Magic Mountain have plans for this Flagship location. I hope you enjoyed this little series of Magic Mountain Slides and goodies. Slides from the Mountain are pretty rare so if anyone has vintage images of Magic Mountain, please share them. Souvenir Saturday - Got a Light?